While welcoming students from all religious backgrounds – and none, Sligo Grammar School has a strong Christian Ethos. The Cabin is an important part of this. The Cabin is situated to the right of the Assembly Hall. 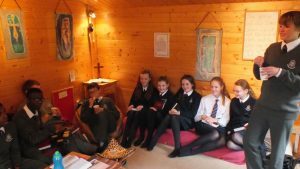 The purpose of the Cabin is to provide a Christian space for all students to enjoy. It is open at lunchtimes and is a quiet and comfortable place for students to get away from the hustle and bustle of the school. It has a calm and restful atmosphere and allows students relax in a prayerful, meditative way. 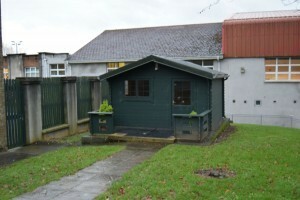 The Cabin is used by everyone, students, parents and school staff alike. 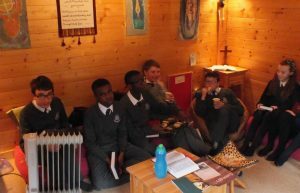 We thank the Church of Ireland Priorities Fund for helping to make the Cabin possible. This year, with the departure from the teaching staff of Ruth Galbraith, the Cabineers are under the guidance of Mr. Damian Shorten. Students gather in this comfortable space to chat and have the occasional treat! There is currently a small group of students who meet as a Christian Union. They meet every Wednesday at lunchtime. They are given a chance to express their opinions in a relaxed atmosphere. They have a committee of students who have taken over running the meetings and organising the events. The Cabin has also a more casual group called “The Cabineers” who meet at lunchtimes on Fridays. This group is aimed at Juniors only, and each week there is a short activity, a thought for the week and a prayer. The activities can involve arts and crafts, watching a video clip, playing a game or exchanging ideas. This group also makes and uses prayer stations – e.g. stones, shells, prayer wall or prayer chain. In previous years The Cabineers have been responsible for special activities coming up to Christmas and for decorating The Cabin. A number of parents meet on regular occasions to pray. They pray for the school, students and other issues. This is a good way for parents to give something back to the school. Anyone interested in being notified about this group should contact the school or Canon Bamber. For news on our Fields of Life project please see our special projects page.